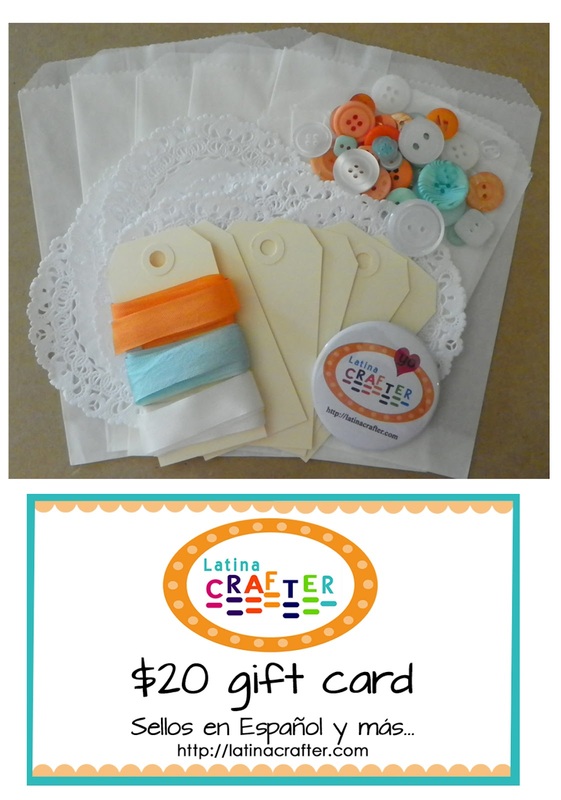 Latina Crafter Junio Blog Hop + Giveaway!! Hello my friends! 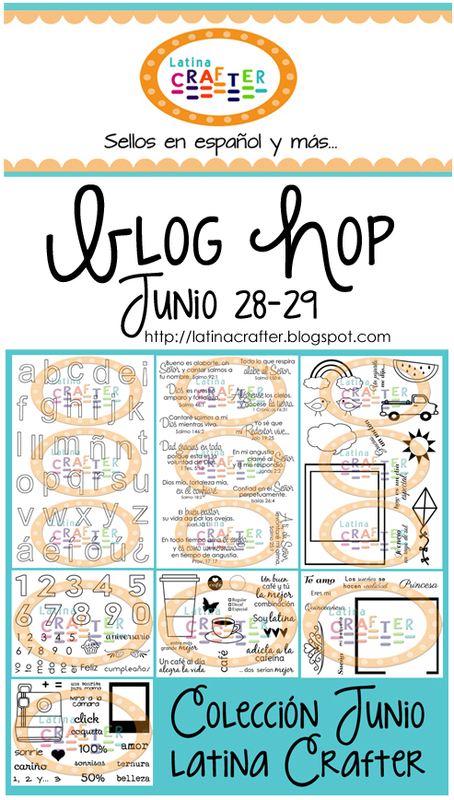 Today, I am joining the Latina Crafter's Design Team for a fun blog hop showcasing the beautiful sets of June. Feliz cumpleaños 21: Una tarjetita muy colorida para alegrar el cumpleaños de una linda amiga. 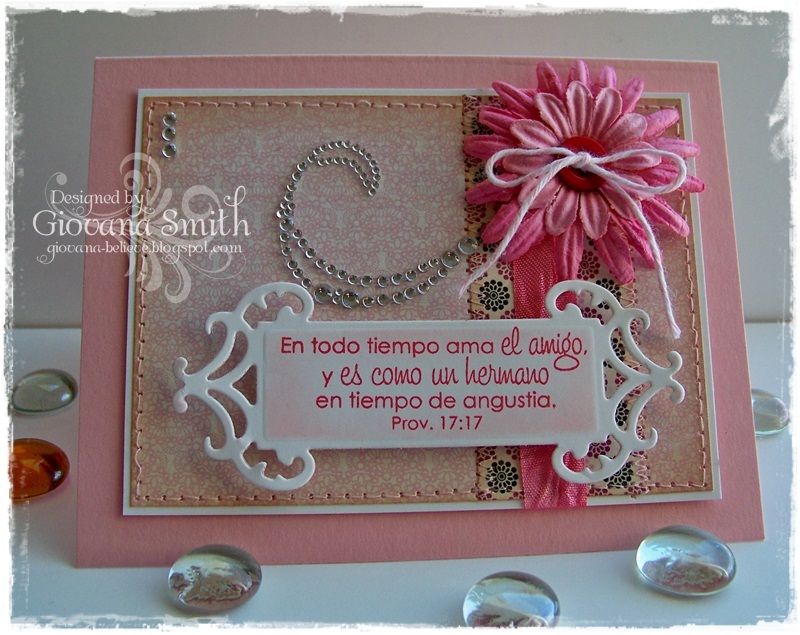 La base de la tarjeta fue hecha con "Fleur de Lis Square Dies". Usé dies para cortar las flores y hojas en fieltro, le agregué una perlita en el centro. El numero fue estampado en el mismo papel, cortado y pegado sobre la base blanca. 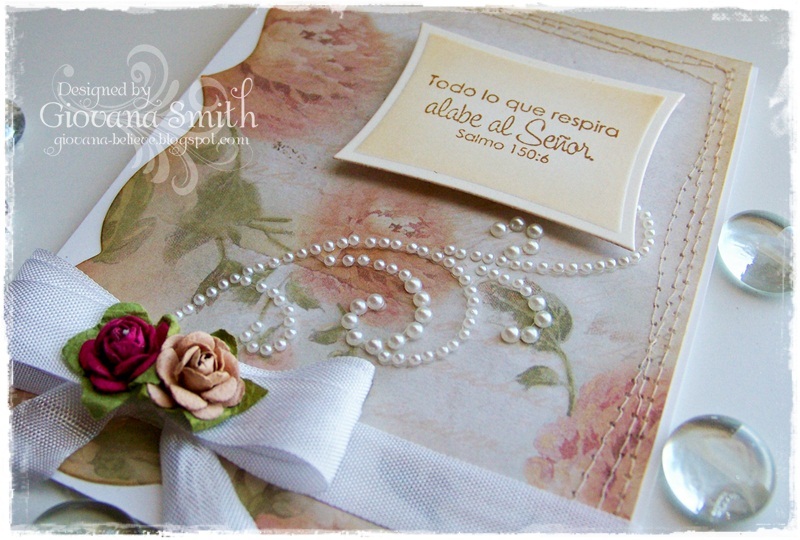 Salmo 150:6 "Todo lo que respira alabe al Señor". Este es uno de mis sets favoritos. Me encantan los versiculos biblicos. 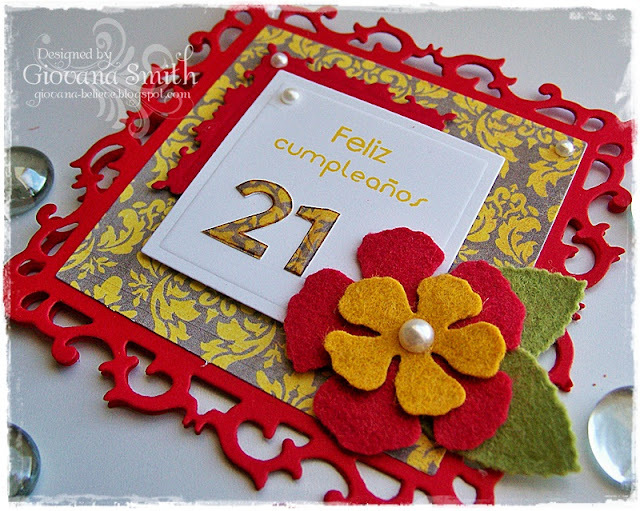 Para esta tarjeta usé papel de KaiserCraft, mi cinta blanca preferida, le añadí un par de florecitas de papel y el flourish de perlas. Al papel le agregué unas tres pasadas con mi máquina de coser. Espero que les gusten mis trabajos, sus comentarios son muy bien recibidos. Si tienen alguna pregunta, no duden en dejarme un mensajito y yo con gusto les escribo. 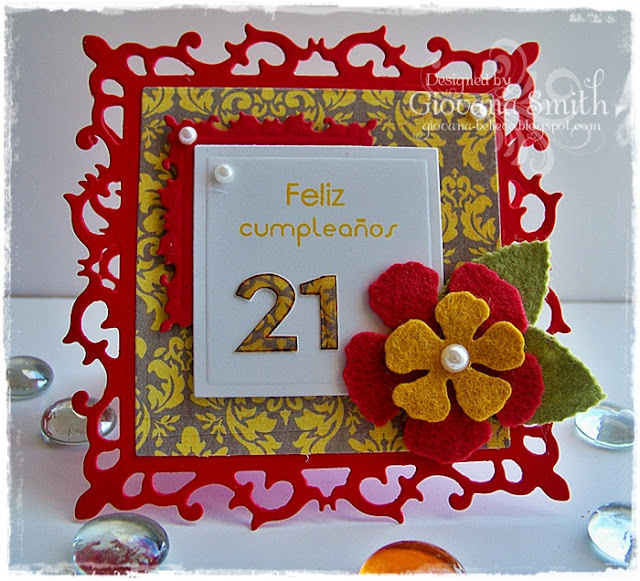 No se olviden de dejar sus comentarios en todos los blogs de hoy y serán incluidas en el sorteo de una tarjeta de regalo con un valor de $20.00!! Hello my friends! Do you love watercoloring? I do!! 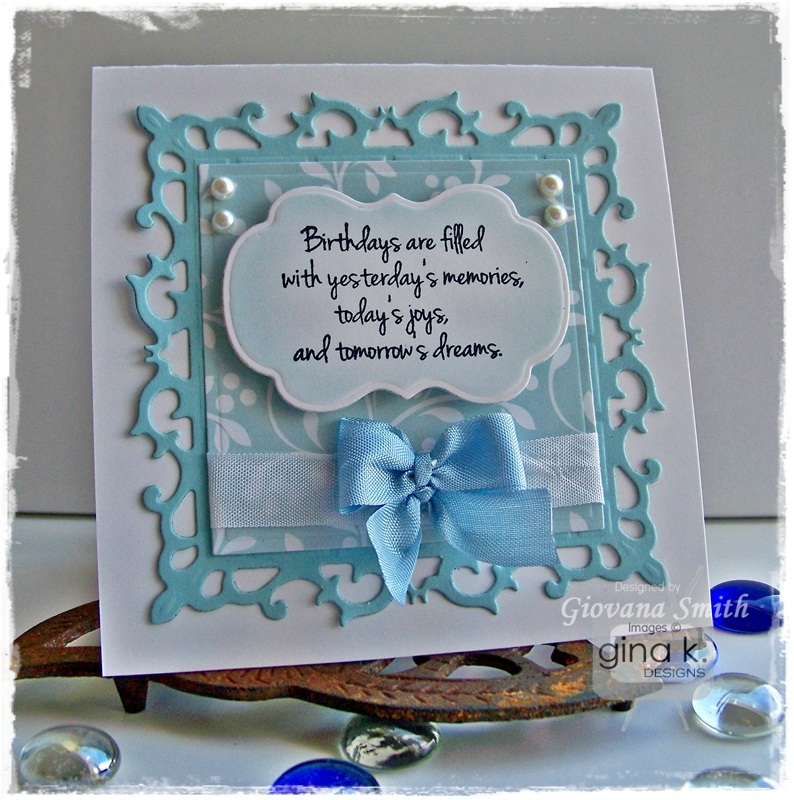 and the images from Heartfelt Creations Stamps are perfect for it. I really enjoyed coloring this image using Inktense Watercolor Pencils, they are fantastic!! 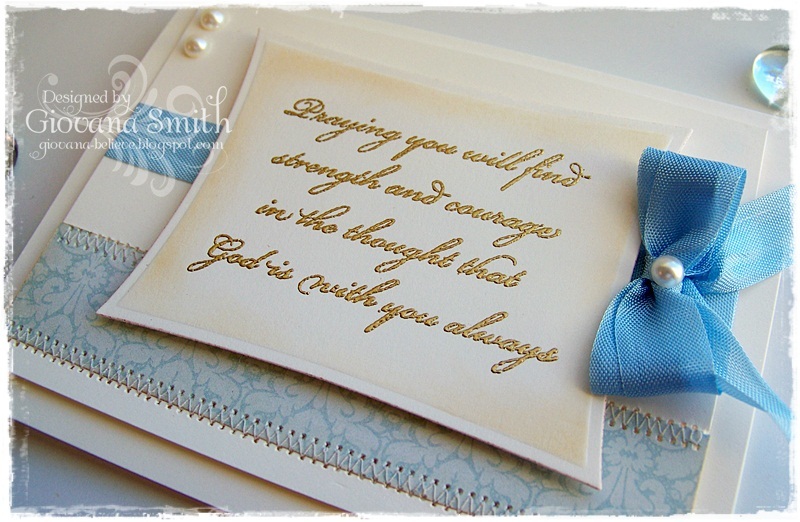 Add Burlap fabric to front of card, tie on ribbon and add Pearl Brad. Stamp image on Watercolor Paper in Black Archival Ink. Color image with Inktense Watercolor Pencils. Add White Gala Glitz to river. Die-cut and emboss imag with Wonky Rectangle Dies. Die-cut (x2) fence in Ivory Cardstock. Add them to image. 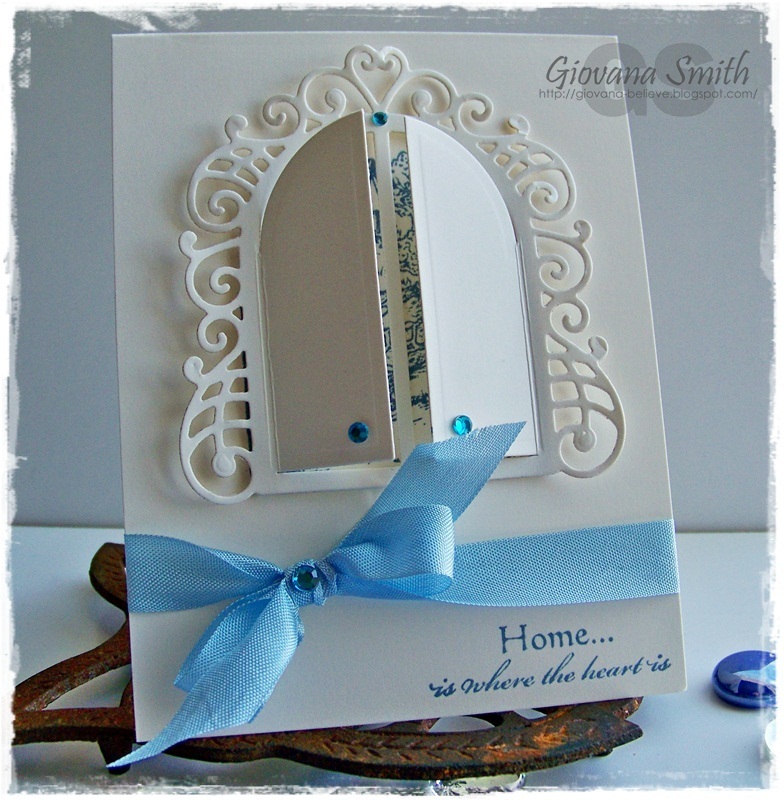 Add image to card base with foam tape. Ink: Black Archival, Vintage Photo Distress (Ranger), Inktense Watercolor Pencil. 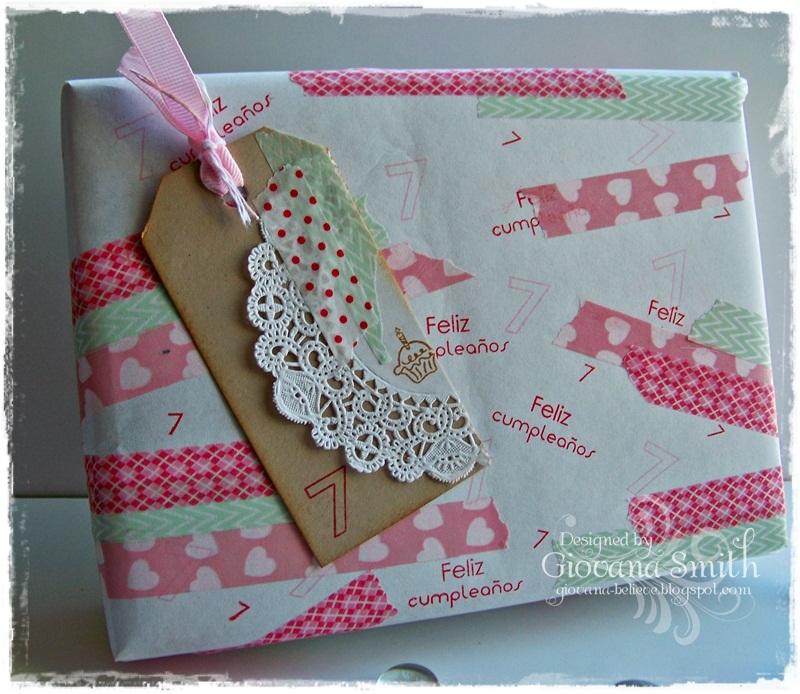 Accessories: Seam Binding Ribbon (etsy), Burlap, Wonky Rectangles Dies (Spellbinders), Pop dots. All the products in blue can be found at the Heartfelt Creations StoreHope you like it. Anyway, My daughter had a couple of birthday parties and we decided to get creative and made something original and special for her friends. We came up with this cute idea for headbands. 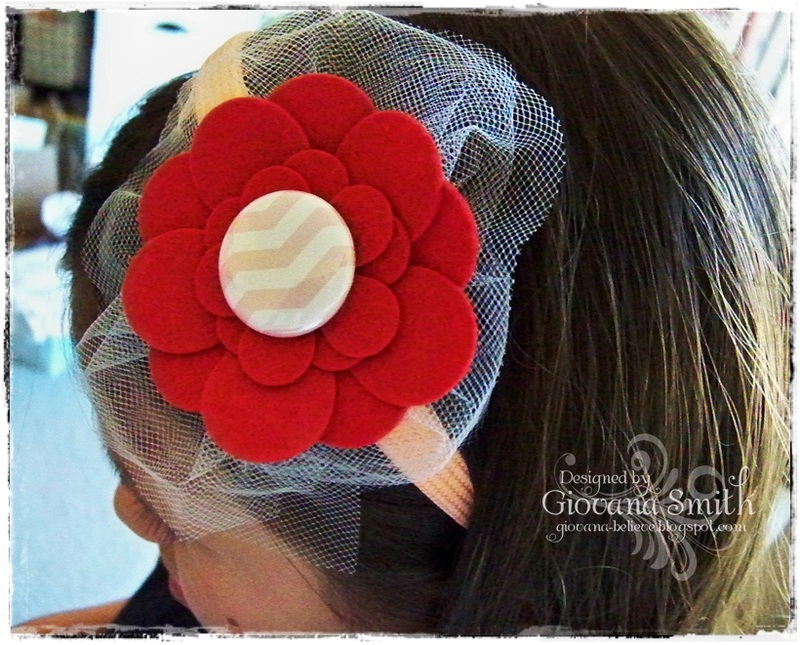 The die flower is "Posy Patch Die" from Heartfelt Creations and the chevron bitty buttons are from Latina Crafter. I bought the felt from Benzie Bazaar (etsy), I highly recomment this felt, it is fantastic to use on your die-cutting machine. Submitting this project to "Simon Says Challenge: Anything but a card"
Hello my friends! Hope you are having a great day. 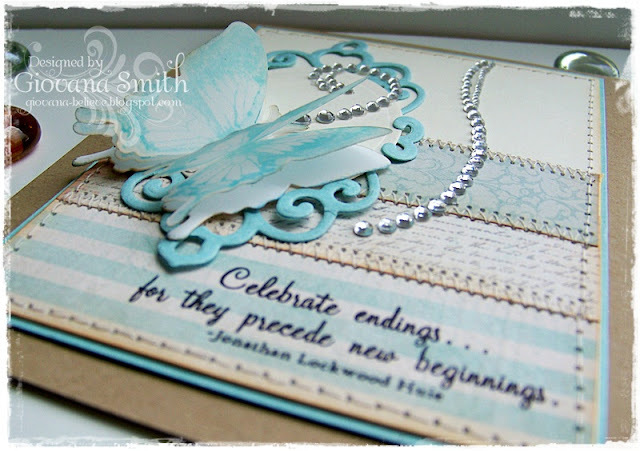 For today I have a card using the "New Beginnings" set and butterfly dies by Sweet 'n Sassy Stamps. I really love the butterflies in this set. 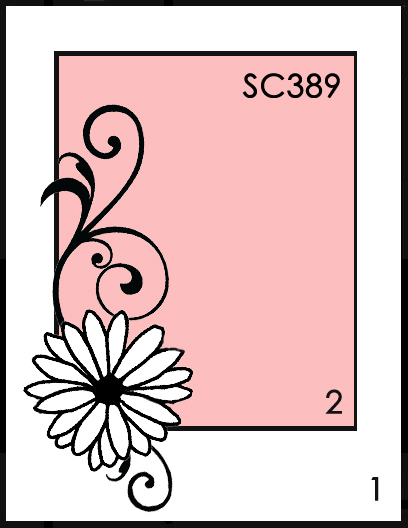 Also I used the sketch for this week's challenge over at Splitcoaststampers. Cut a panel from Ocean Mist Cardstock and mat it with a smaller piece panel from Ivory Cardstock (3.5" x 4.75") Add strips of Patterned Paper (I used little scraps!) and add stitches. Die-cut and emboss an Oval piece from Ivory CS and a Tag from Ocean Mist CS. Mat them together and adhere it to card panel. Hello!! Hope you are having a great day. 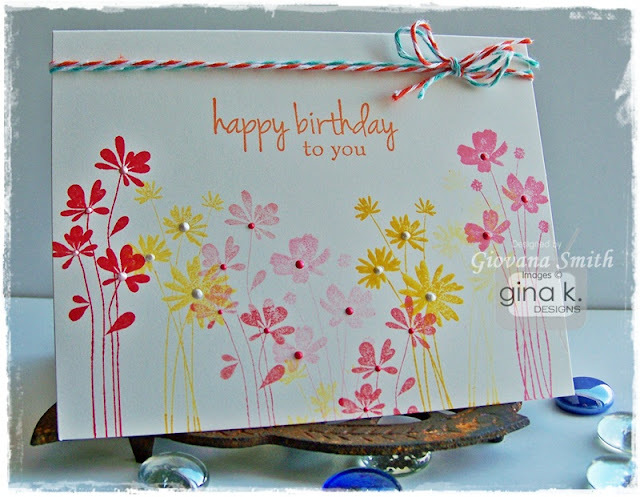 Today I have a pretty card using Heartfelt Creations Stamps! The image and fence is from the newest Release! I love them very much. Make card base from White Cardstock (5' square). 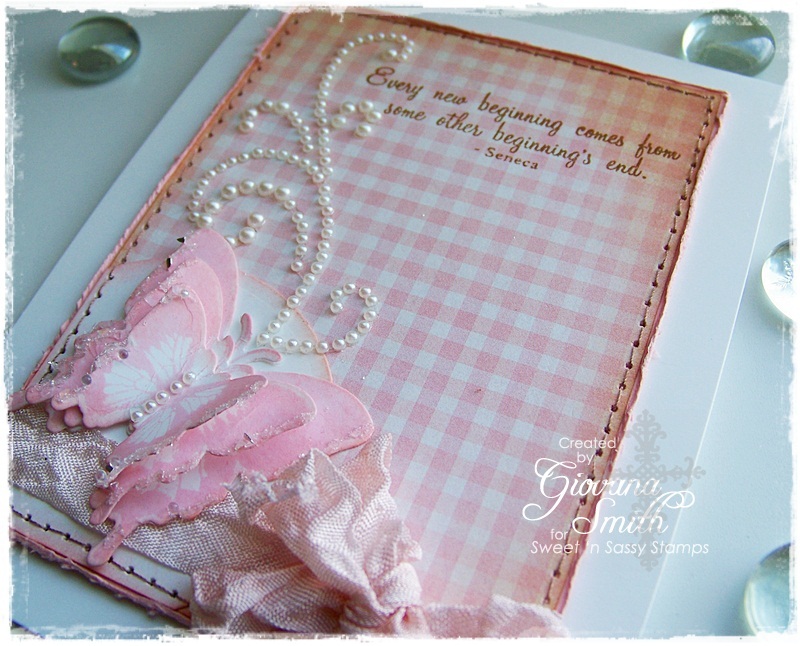 Mat Innocent Pink Cardstock and Patterned Paper, ink all edges and add stitches. Stamp image on White Cardstock in Black Archival Ink. Color it with Copic Markers. Die-cut, emboss and stencil it with Circle Nestabilities. Adhere it to card with foam tape. Add White Gala Glitz to flowers. Die-cut fence x2 from White Cardstock, glue them together (for more dimension) and add them to image. 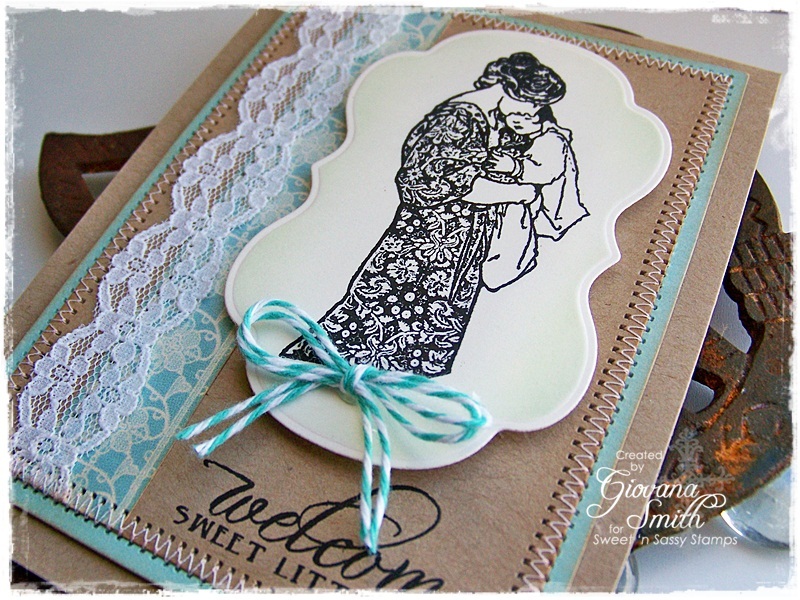 Stamp sentiment on White Cardstock in Vintage Photo Distress Ink, Die-cut, emboss and stencil it with Labels Fourteen Nestabilities. Create a bow, add Gold brad and adhere it to card. Accessories: Labels Fourteen Nestabilities (Spellbinders), Seam binding ribbon (etsy), Pearls, Sewing machine, Scor-tape. Hello my friends! Today I am participating in a different kind of blog hop. Few days ago the stamping/crafting community lost a super talented, sweet and fantastic lady: Lisa Lynne Wright. She always had the most wonderful and sweet words for you and your work, she was very talented and she will be missed for sure. 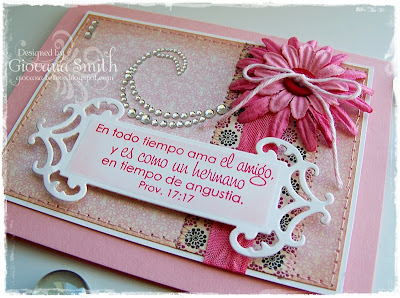 I got to know her through our Design Team for Heartfelt Creations. I made this card to send to her husband. He will be hopping as well. If you would like to leave a message here to her husband, you are more than welcome. 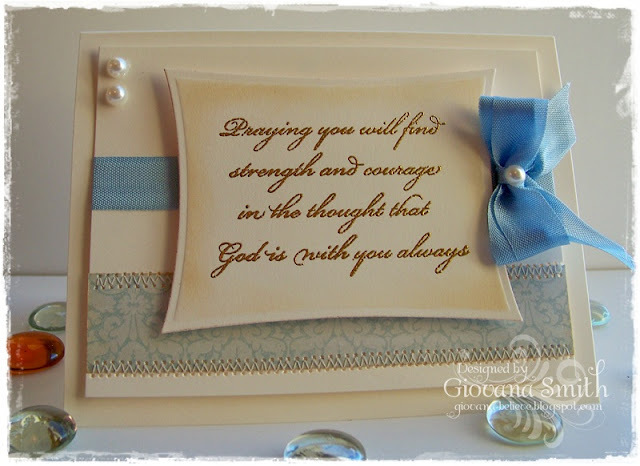 Sentiment from Heartfelt Creations Stamps. Sue Walsh: A Consuming Passion! 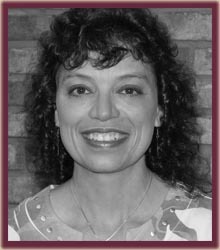 Carol Hurlock: Chocolate Crafts and Bears, Oh My! Emily Neihaus: Emmie-Lou Who...Stamps & You! 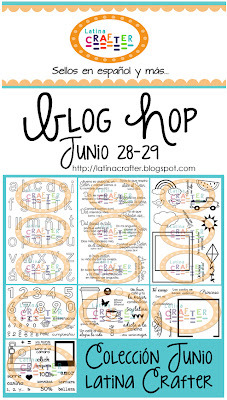 Nuevos sellos de Junio de Latina Crafter!! Hello! Today I am blogging in Spanish as a Guest Designer for Latina Crafter! Hope all my English speaking friends can enjoy this post as well. Thanks! Hola!! Hoy tengo 3 projectos super especiales que he hecho usando los nuevos sellos de Junio de Latina Crafter, primero quiero agradecer a Diana por la invitación para ser la Diseñadora Invitada este mes y tambien quiero agradecer a todas mis amigas de habla hispana que me estan visitando el dia de hoy. Feliz Cumpleaños Cajita y Tag: Para este trabajo usé el set Números. Esta idea la tenia en mi cabeza hace ya un tiempo, super sencilla y muy original. 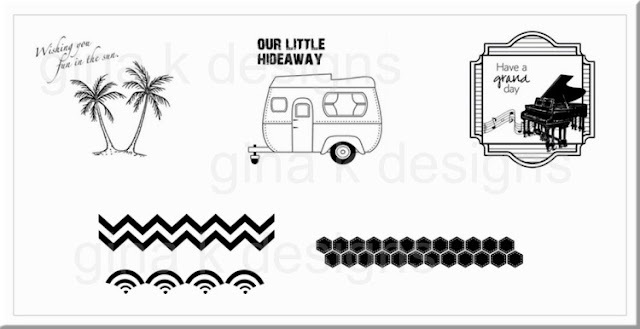 Para este projecto envolví una cajita con papel blanco que usa mi hija para sus dibujos y empecé a sellar el papel con el número 7, luego le agregué Washi Tape en 3 diseños diferentes. Le agregué un tag a la cajita, el tag lo decoré con un pedazo de Doily blanco, cinta rosada y Washi Tape. Prov. 17:17: Para esta tarjeta usé el set "Confianza y Alabanza en el Señor". Este versiculo es uno de mis favoritos. La tarjeta es color rosado, usé papeles de My Mind's Eye (Lost & Found Two) y usé mi máquina de coser para añadir algo extra. 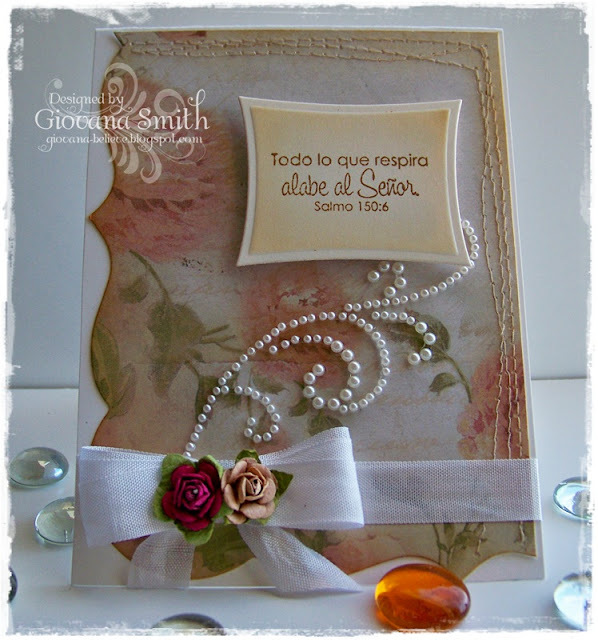 La cinta es llamada Seam Binding. Le agregué un par de flores de papel rosado al cual le puse un botón rojo con Twine rosado. Espero que les gusten mis creaciones, si tiene alguna duda o necesitan más información, no duden en preguntar o dejarme un mesajito. Hello my friends! I have great news to share with all of you. I am a "Dirty Dozen Girl"! I am so excited, it has been really hard to keep the secret and I am so happy it's finally out! 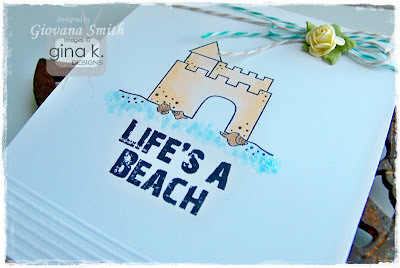 If you are a Fan Club Member over at Splitcoaststamper, I invite you to check out the projects I am sharing there, the gallery is fantastic!! Come back later! I have great news to share with you. Cut a panel from Patterned Paper (Lost & Found Two Collection "Blush" My Minds Eye), ink all edges. Mat this piece with a slightly bigger piece of Pink Cardstock. Add Circle piece from White Cardstock. Add stitches and distress al borders. Die-cut butterflies from White Cardstock, stamp butterflies in Spun Sugar Distress Ink. 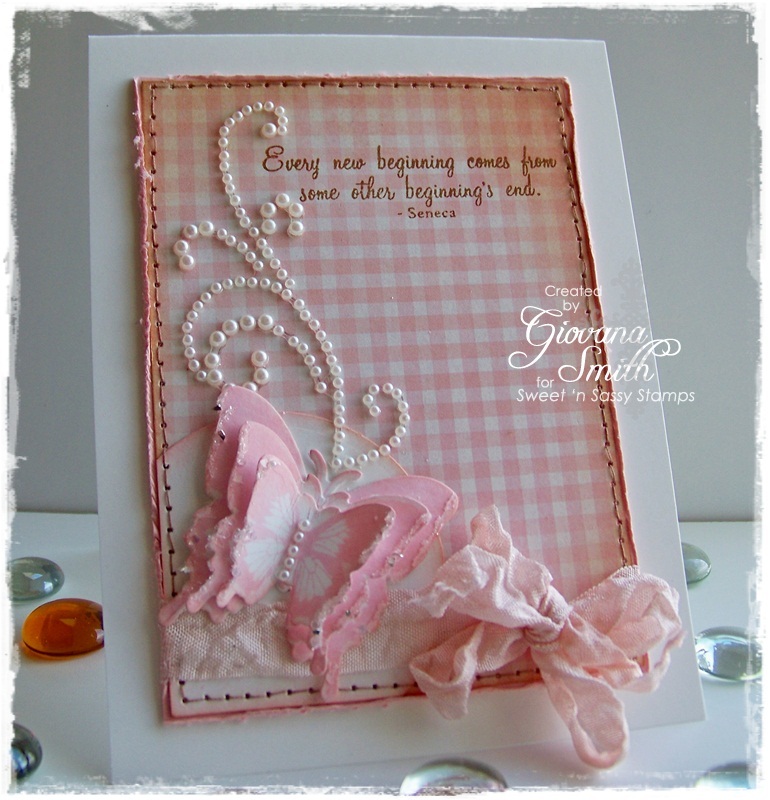 Layer all butterflies, add White Gala Glitz on butterflies edges. 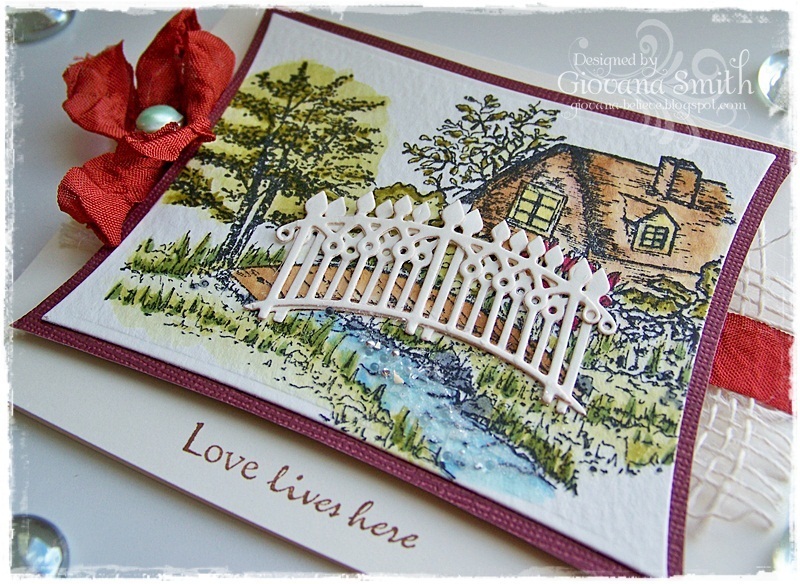 Heartfelt Creations June "Garden Romance Collection"
Hello my friends! Heartfelt Creations has another beautiful Collection for this month. 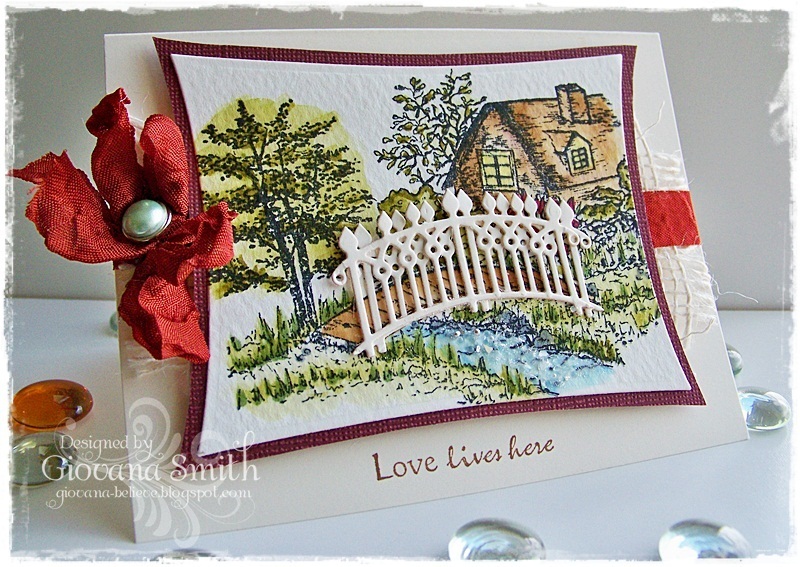 It is called "Garden Romance Collection"
The Garden Romance Collection is teeming with birdies, butterflies and blooming peonies. 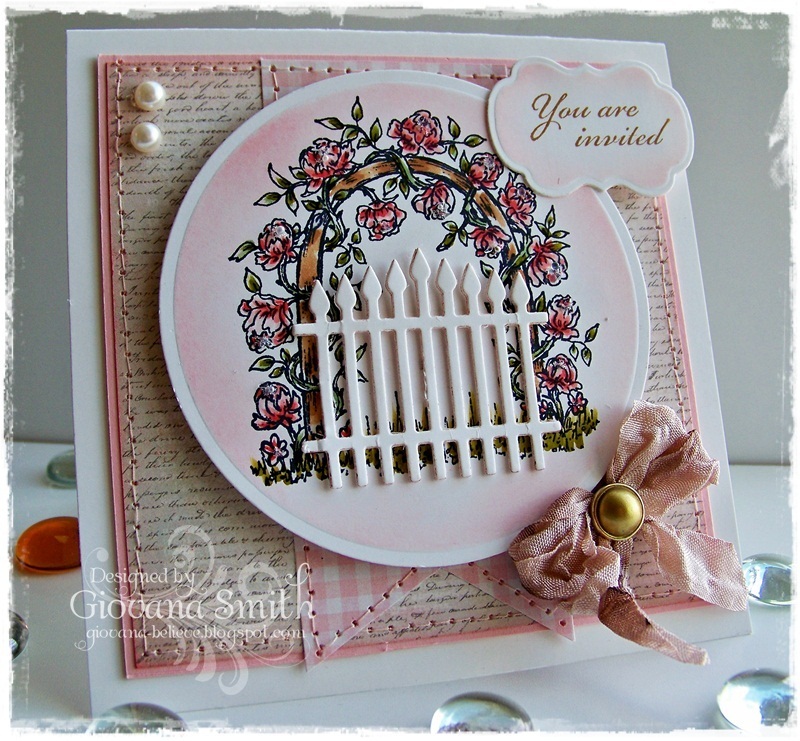 Fun bird houses, mailboxes, and trellises dot the landscape of this new set. Don't say you weren't warned- you may get butterflies in your stomach. 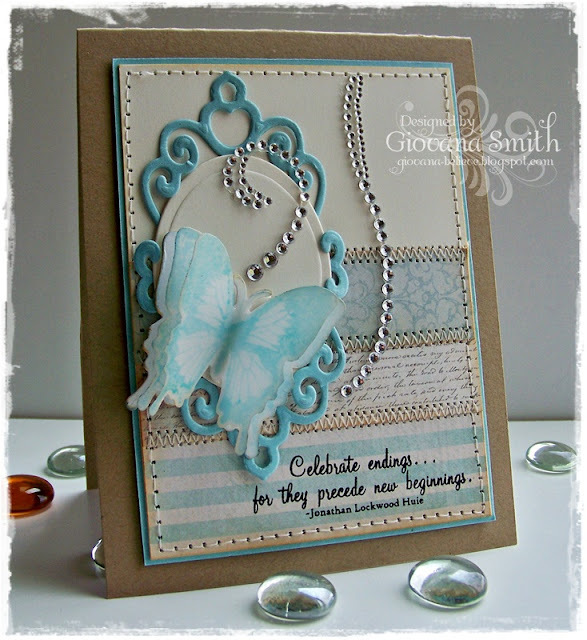 There are 7 new PreCut Stamp Sets and one beautiful new exclusive Spellbinders die designed for Heartfelt Creations. 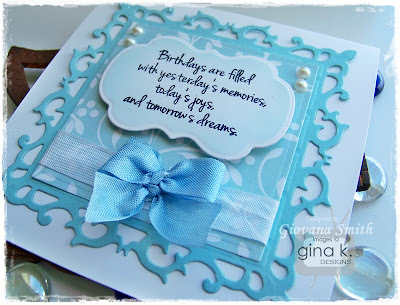 Die-cut and emboss bottom front of card with Classic Bracket Shapeabilities Dies. Cover back part with Gold Cardstock. 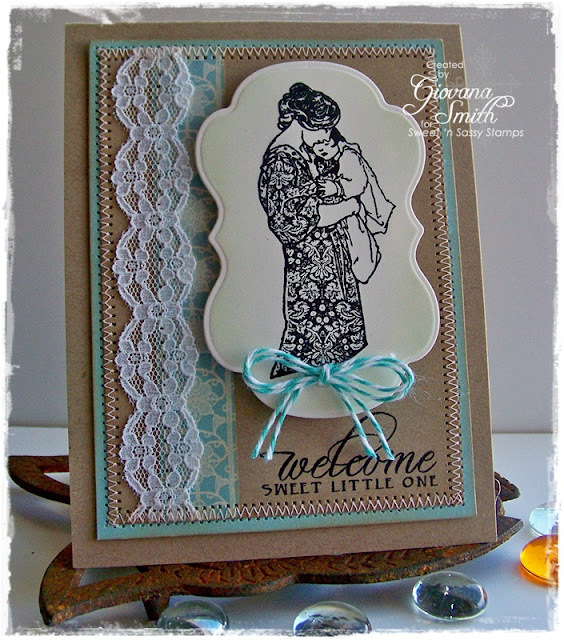 Stamp saying in Vintage Photo Distress Ink, add Clear Embossing powder and heat it up. Die-cut circle frame in Gold Cardstock and add it to "On" image. Add 2 mini Silver brads to gate. 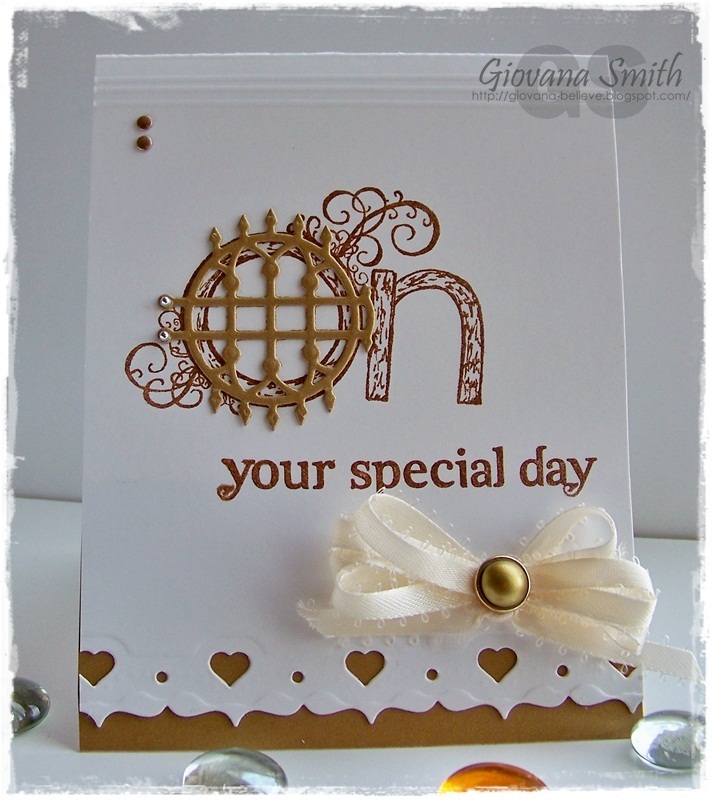 Score 3 lines on top front of card using Scor-buddy, add mini gold brads. Make a bow with Bow-easy and add a Gold Brad. Adhere it to card. 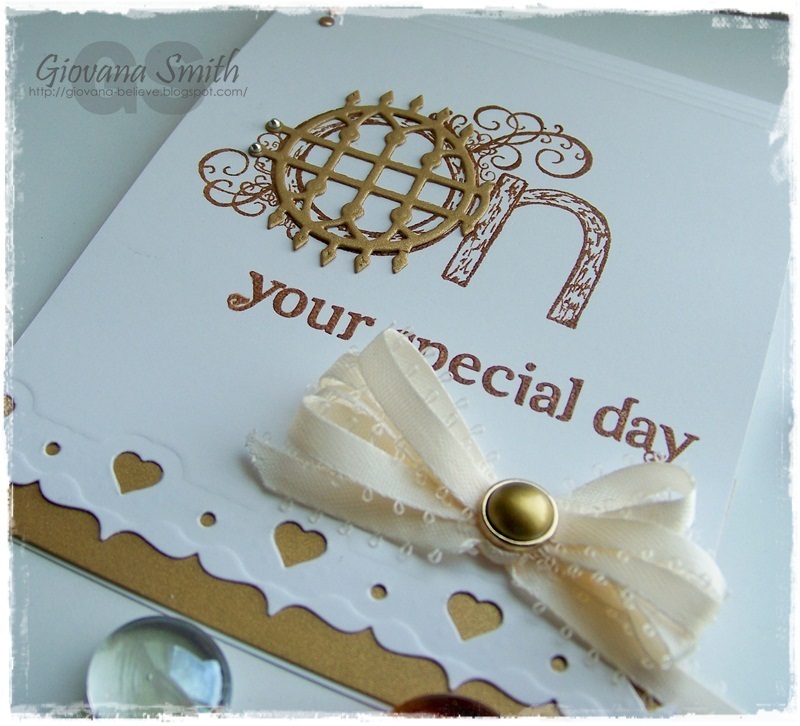 Accessories: Beige Ribbon, Mini Silver Brads, Mini Gold brads, Scor-buddy, Clear embossing powder, Embossing heat gun. 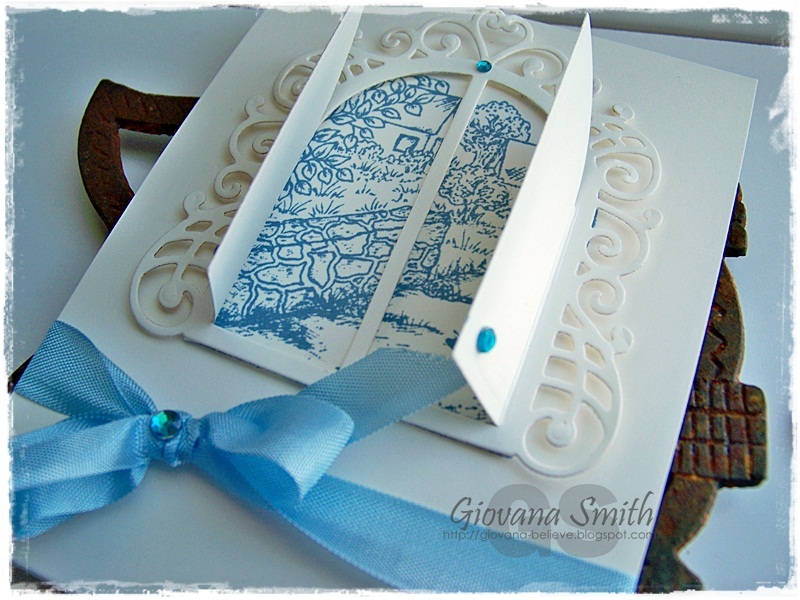 Make card base from Ivory Cardstock. 5" square card. Mat and distress all edges of Burdungy and Patterned Paper. Add stitches.Add Lace Tape Ribbon and Ribbon. Adhere it to card front. Stamp image from Bird Haven Set on Watercolor Paper in Black Stazon Ink. Color it with Inktense Watercolor Pencils. 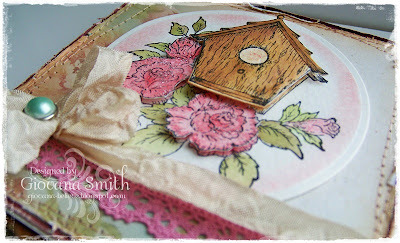 Stamp bird house and color it with Watercolor Pencils as well. Die-cut image with Bird House die from Garden Romance Die Collection. 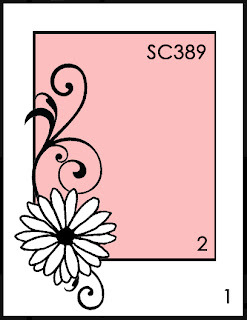 Stamp flowers, color them and cut them out to give the main image more dimension. Die-cut, emboss and stencil main image with Circle Nestabilities. Add main image to card base. Add flowers with mini pop dots. Add bird house with large Pop dots. Add stickles to flowers. Tie on ribbon and adda Pearl Brad. Add tiny pearls to right corner. Inside: Stamp sentiment in Vintage Photo Distress and image in Tea Dye Distress. Now, would you like to win this wonderful collection?!! 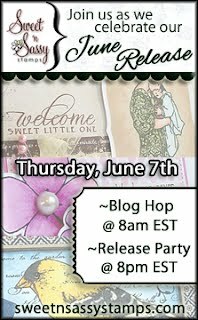 Leave a comment on the Heartfelt Creations blog by June 19th and you will be eligible to win the entire release valued at $141.99. Hello my friends!! I have a really cute Baby Card for you today. 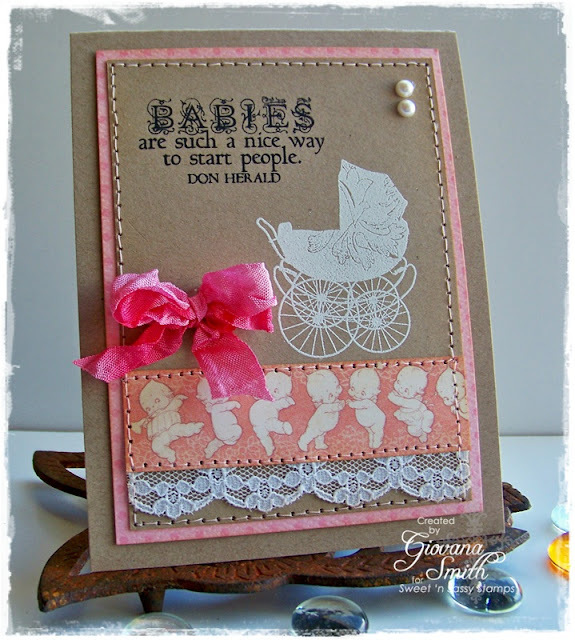 I really love the new Vintage Baby set from Sweet 'n Sassy Stamps, this set is just adorable. I made this card in blue, but it can easily be changed to yellow or green. Cut a panel from Kraft Cardstock and add Patterned Paper (Baby Borders by Graphic 45) and White Lace Ribbon. Mat this piece with a slightly bigger piece of Ocean Mist Cardtsock. Add zig-zag stitches. Stamp image on Ivory Cardstock in Black Archival Ink. Die-cut, emboss and stencil piece with Label Fourteen Dies. Make a bow with Twine and add to image. Sweet 'n Sassy June Release is here!! 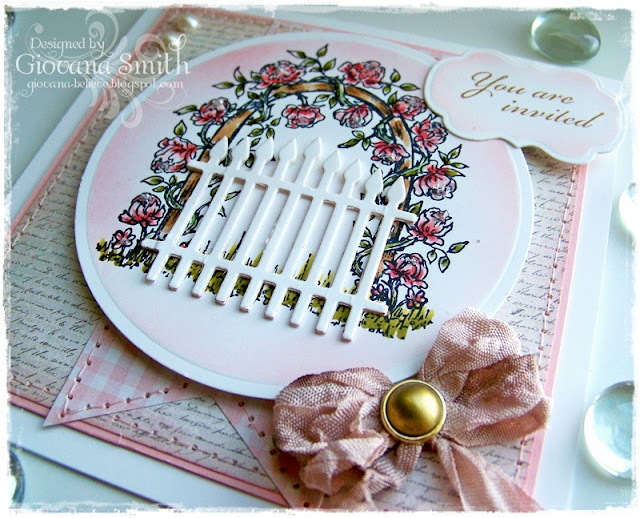 Welcome to the Sweet 'n Sassy Stamps June New Release Celebration! All of the Design Divas are excited to kick things off today with a fun blog hop full of inspiration using the sets that will be available for purchase in the store tonight. Ready to get started? I have 2 beautiful sets to showcase to you today. These are the projects I created for you. 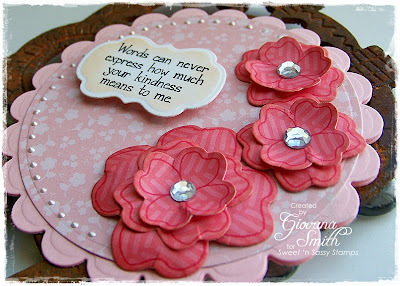 Kindness: Very pretty and feminine card. Love the coordinated stamp/dies. 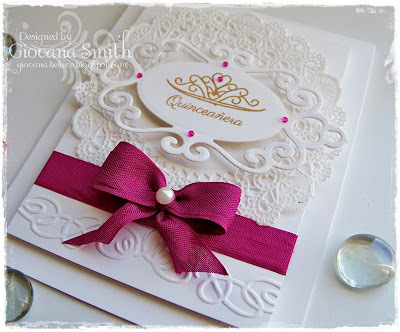 Die-cut and emboss Pink Cardstock (x2)using Scallop Circle Nestabilities to create Circle Card. Die-cut and emboss a piece of Patterned Paper using the largest die from Circle Nestabilities Dies. Adhere it to card base. Die-cut flowers from patterned paper. Stamp flowers on to Patterned Paper, curved all flower petals and mount them together to give more dimension. 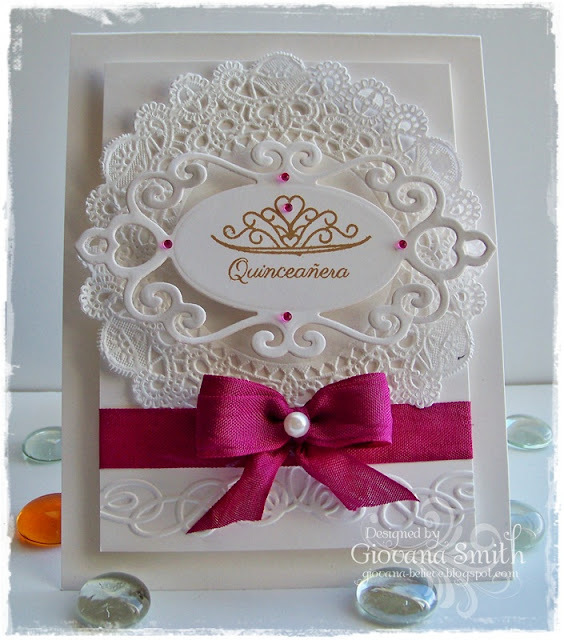 Add flowers to card front and add a clear rhinestone. Stamp sentiment on White Cardstock in Black Archival ink. 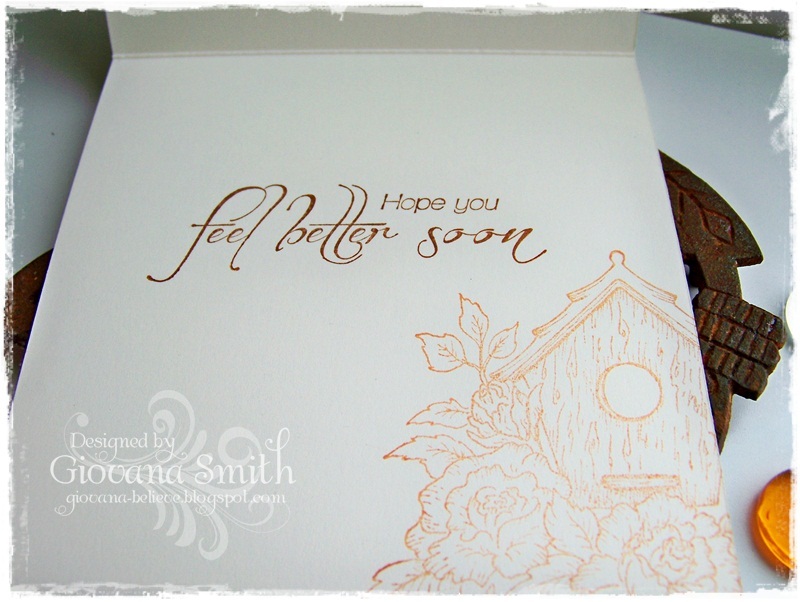 Die-cut, emboss and stencil sentiment, adhere it to card. 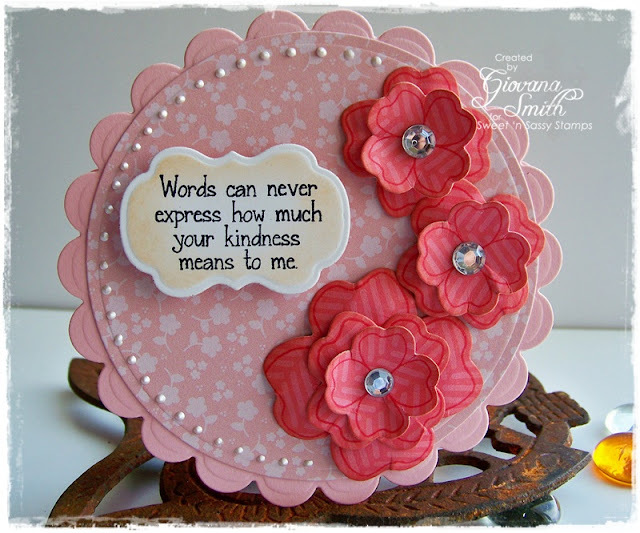 Accessories: Kindness Dies (Sweet 'n Sassy Stamps), Scallop Circle and Circle Nestabilities, Label Fourteen Nestabilities (Spellbinders), Pop dots, Paper Blossom Tool Kit. Cut a panel from Pink patterned Paper, ink all edges. Cut a panel from Kraft Cardstock. 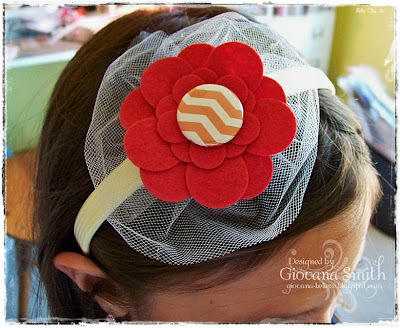 Add a stripe of Patterned Paper and Lace Ribbon. Mat with Patterned Paper and add Stitches. 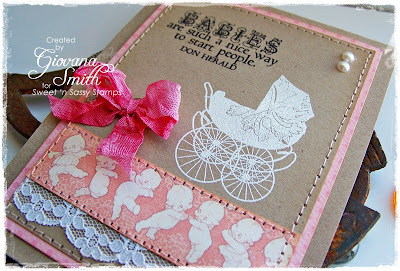 Stamp stroller in Versamark Ink and Add White Embossing Powder, heat it up. Male a bow and add to card. 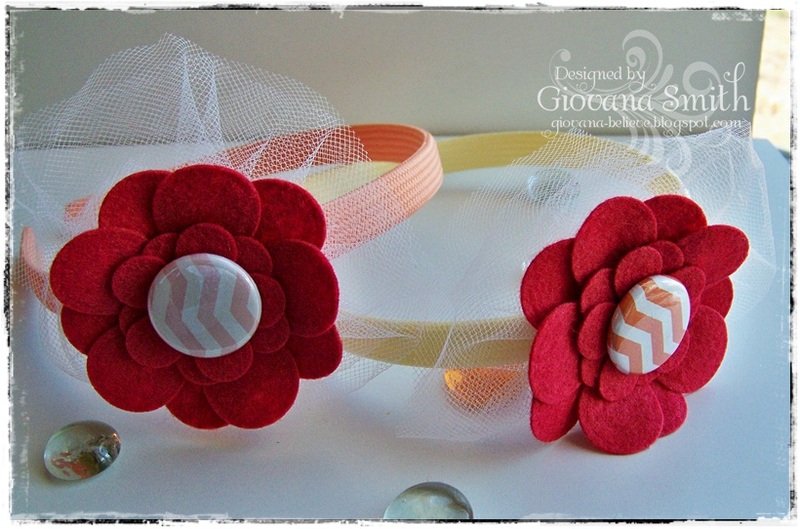 Embellishments: Hand-dyed Seam Binding Ribbon, White Lace Ribbon, Pearls. Accessories: White embossing powder, Embossing heat gun, Sewing machine. Hello my friends! Hope you are having a great day. I have a "CAS" (Clean and Simple) card for you today using Heartfelt Creations Stamps. Stamp image and sentiment direct on to card front in Stormy Sky Distress Ink. 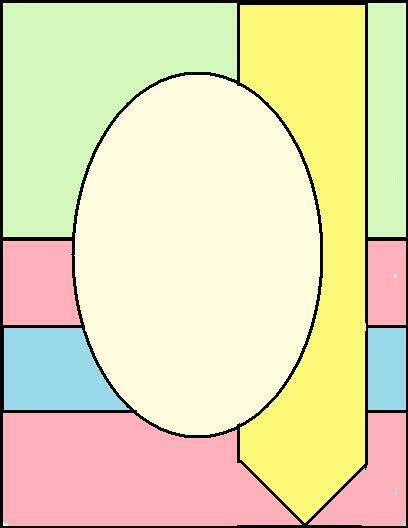 Die-cut window frame in Ivory Cardstock. Adhere frame to card with pop dots adhesive. Hope you like my projects. 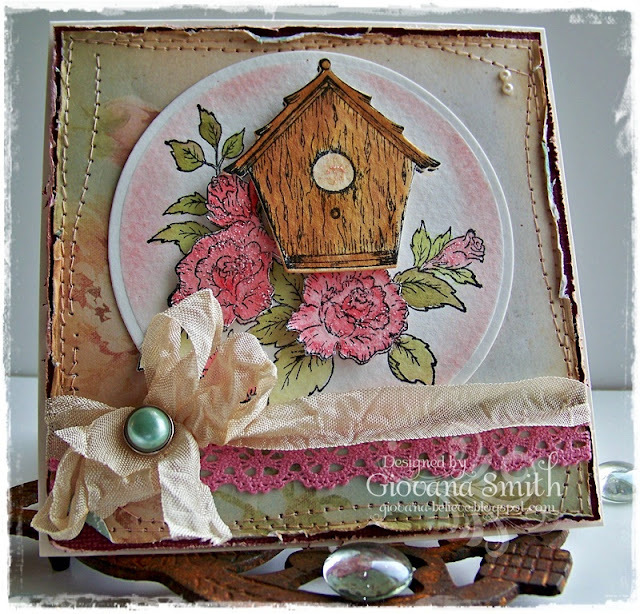 I invite you to visit the Heartfelt Creations Blog for more inspiration from the Design Team. Today, I have 3 cards for you. Every card has a little explanation on the how's and products used. Sadly, I am dealing with bad allergy problems and also a cold, yes I am very lucky, not! Thanks for your understanding. Hello Sunshine StampTV kit. This new kit is super cool, with beautiful bold images as well as some for coloring :) I stamped the flip flops and sun, colored them with Copic Markers and cut them out. I also stamped some sun images on to White CS, colored them with a Yellow marker and add it behind the tag. The Green Chevron Patterned Paper is from Sunshiny Day Collection (GKD). Cardstock colors used: White, Lemon Drop and Kraft. Birthday Greetings. This card is 4.75" square. I used White, Ocean Mist CS. Fleur de Lis Square, Square Nestabilities and Labels Fourteen Nestabilities(Spellbinders). The patterned Paper is from Berries and Vines Collection. Ribbon is White and Light Blue Seam Binding. Pearls were added to top corners. 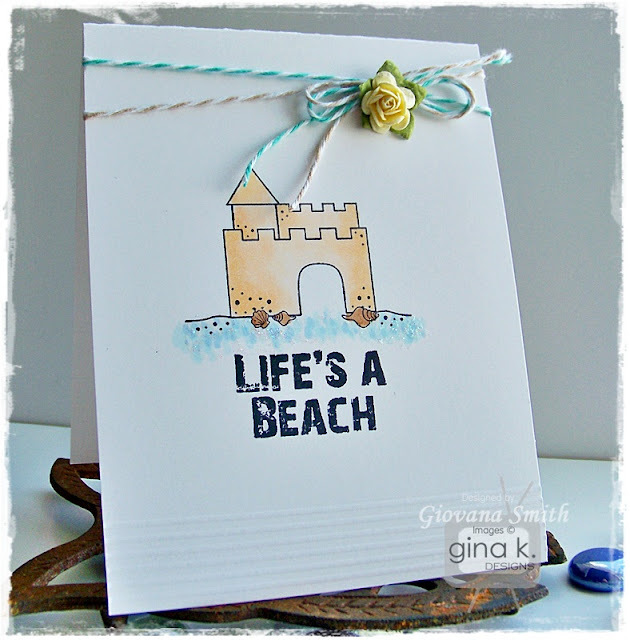 New One free with 3- Life's a Beach. This is a super CAS card, the bottom part was scored 6 times every 1/8". The images were stamped in Memento Tuxedo Black Ink and color with Copic Markers, added a bit of Star Dust Stickles. Finally I made abow using two colors of Twine and added a paper flower.